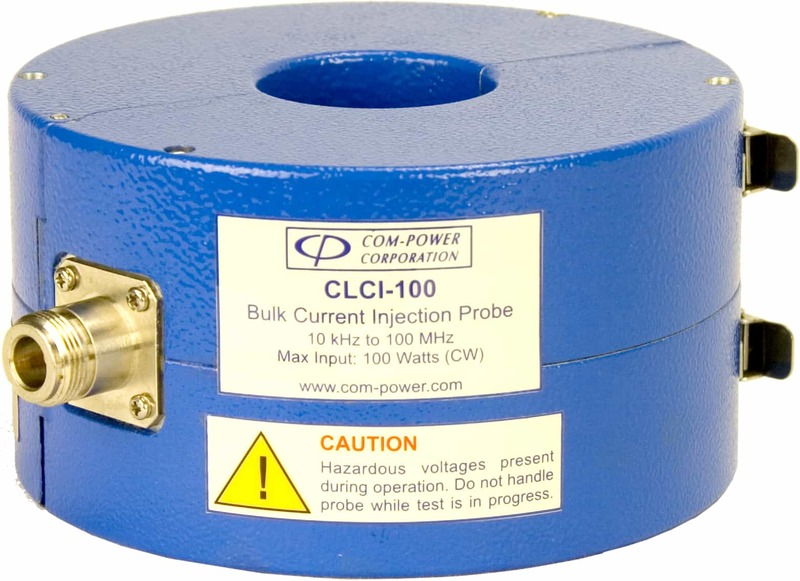 The CLCI-100 Bulk Current Injection Probe is part of ComPower's extensive line of radio frequency conducted immunity test equipment and calibration accessories; geared specifically to comply with the requirements contained in IEC 61000-4-6 and CISPR 16-1-2. The CLCI-100 incorporates split-core ferrites into its rugged circular enclosure and is hinged; thereby allowing the probe to be opened on one side in order to easily place the wire cable(s) or cable bundle(s) to be tested into the probe window making the CLCI-100 much more convenient to use than other non-split core probes. The efficiency of the CLCI-100 probe enables it to achieve test levels up to 10 Vrms across its frequency band with less than 100 watts forward power. The probe can handle up to 100 amps (window current) on its secondary and up to 100 watts RF input power to its primary. An RF Current probe is typically used in conjunction with spectrum analyzer or EMI receiver which measure magnitude quantities in terms of true rms voltage. The Transfer Impedance conversion factor which is expressed in terms of dB over 1? converts the voltage quantity into a current quantity expressed in terms of dB over 1 uA.